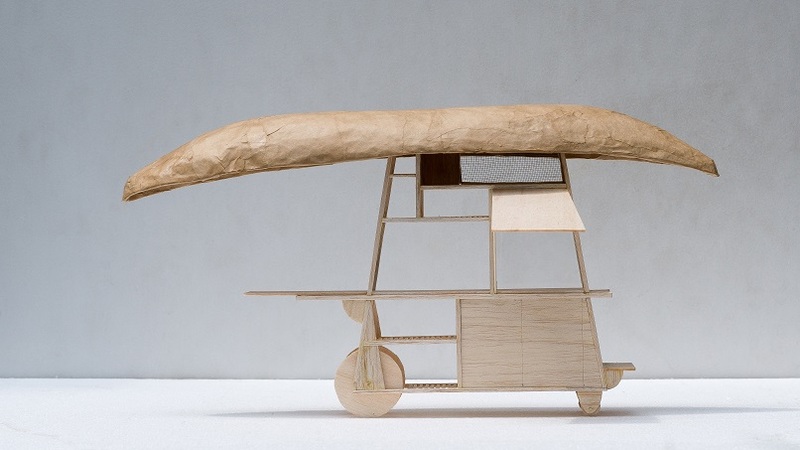 Street food culture has thrived in Asia for centuries. Served via ramshackle roadside stalls and roaming food carts, street food is inexpensive, swiftly prepared and served ready-to-eat, perfect for frenetic city living. For locals, street food and its stalls are a daily staple and gathering point for the community; for tourists and travellers, the cuisine’s signature ingredients, indulgent flavours and vibrant setting are the most evocative lens through which to understand a new place. This rings no more true than in Ho Chi Minh City, Vietnam. Formerly Saigon, this sprawling metropolis is famous for its diverse street food culture. Coffee is an institution here, typically served as a rich mix of condensed milk, dark beans and ice. Local and increasingly international favourites include variations of the bánh mì sandwich, hot pans of runny eggs and meats known as Ốp la, and steaming bowls of phở noodle soup. But equally as integral to the scene are the stalls themselves; situated by the roadside and surrounded by undersized chairs and tables, these venues operate as community hubs, giving customers a space to meet, eat and socialise. The Nguyen Hue Boulevard in Ho Chi Minh’s east, close to what was originally a canal linking Saigon River to the ramparts of the Citadel, was once one of the best places in the city to sample Vietnamese street food. However, in recent years, gentrification has caused the area to be flooded the area with high-end stores and corporate coffee houses, putting the area at risk of losing its signature flavour. 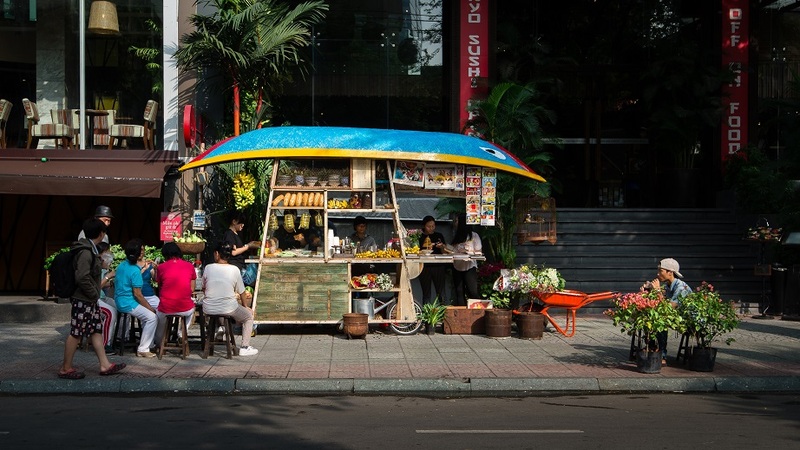 In an effort to restore some of the area’s former glory amidst this emerging urban homogeneity, local firm a21 studio has created Good Morning Saigon, an unconventional take on the traditional food stall. Fully mobile, the stand serves coffee, bánh mì and other roadside delicacies as well as a selection of newspapers and groceries. In their design, a21 studio sought to recall elements of Vietnam’s history and repackage them for the modern day. Assembled from upcycled wood and other materials sourced within the city, Good Morning Saigon makes a bold statement against the metal and glass of the surrounding area with its striking blue, yellow and red colour palette. Upturned boats like the one atop the stand were often used as part of the rear canopies of cross-country trucks to shelter travellers from the beating southern sun. Now simply relics of a bygone age, this striking fixture also harkens back to the days when boats were the most popular means of traversing the city along the River Saigon. 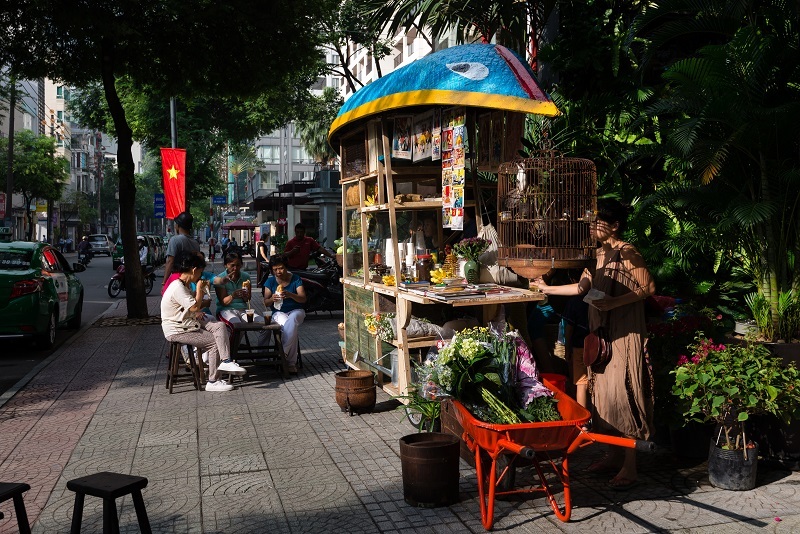 A combination of a traditional means of transport with the flexibility of a mobile stand, Good Morning Saigon demonstrates how intelligent design choices can forge dialogue between the past and the present to revitalise cultural and community landmarks. More photos, please visit PRC magazine Facebook’s Album.